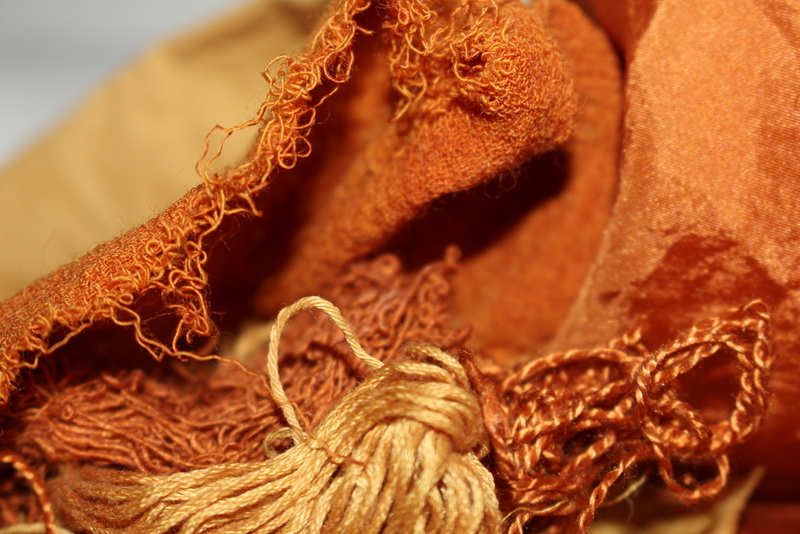 Dyeing with onion skins – what a good result! Have a look at the photo, which shows the bundle of dried fabrics and threads, before ironing. 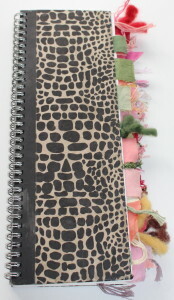 The piece of fabric to the left, which is fraying in quite an appealing way, is wool crepe. This is an excellent fabric for picking up all the dyes I’ve tried so far. To its right is a piece of habotai silk which has taken up a very similar colour. In the background, out of focus, is a piece of lightweight linen which has come out as much more of a sunshine yellow. 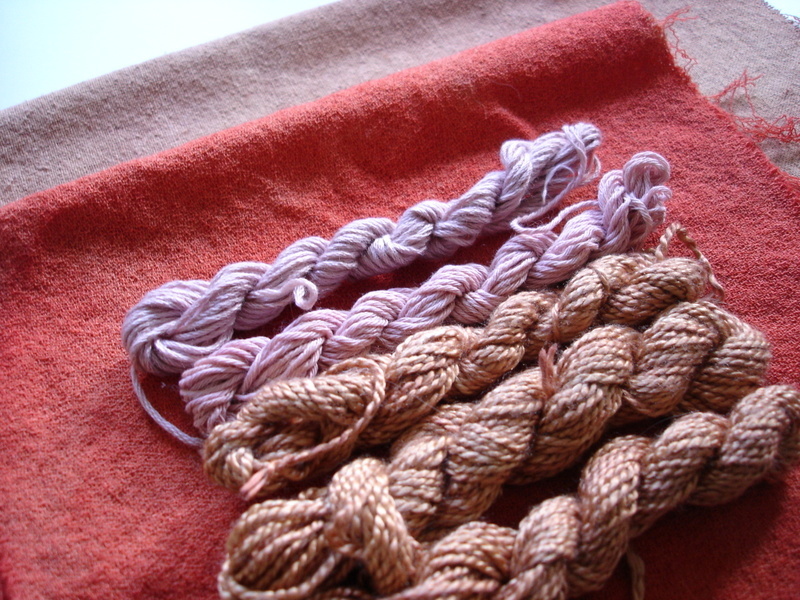 The threads in the foreground are (L) stranded cotton and (R) silk. I’m really pleased with these results, especially as they are low cost as regards the dyestuff. Onion skins are a waste material, normally shoved into the compost bin chez Gowthorpe. After the dye has been extracted, the slimy bits of skin can go into the compost, so no loss there. The only ‘cost’ is remembering to gather them up into a paper bag while you’re doing the food prep. 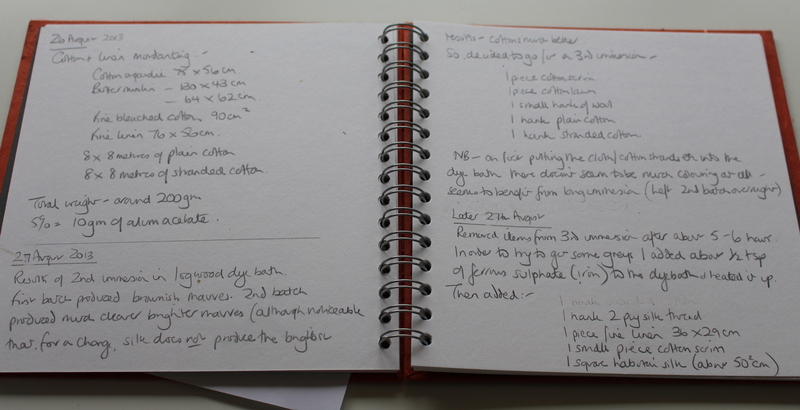 Now that I know how good the results are I’ll be much more inclined to be organised and do this. And this isn’t the end of it. Currently drying on the rack in the kitchen is a second batch of fabrics and threads which were boiled up and left for 24 hours in the dye pot. These are much lighter in colour; paler versions of the colours in the photo above. What’s next? Well… looking out of the window from where I’m sitting typing this, I can see a clump of very healthy-looking rhubarb. Last year I tried using rhubarb leaves for both mordant and dyeing purposes, and I’ll be continuing my experiments very soon. The drawback with rhubarb leaves is that the liquid they produce is highly toxic so it requires care in handling. More reports in due course…. The weather has taken a distinct turn for the better in England and today has been a gorgeous spring day – around 14C, sunny all day and a distinct smell of spring in the air. Very unusual, but all the more welcome. I hope this signals some better weather to come, especially for those who have been battered by storms and flooding. I’m now looking forward to another spring and summer of hanging out dyed fabrics and threads to dry in the garden. 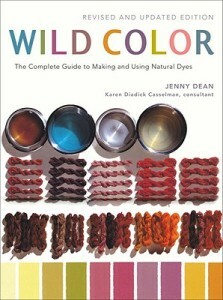 If you’re a reader of this blog and you have any thoughts or useful tips to share about dyeing please leave a comment. When I started experimenting with natural dyes I told myself sternly that I must keep proper records of what I was doing – otherwise I’d get in a hopeless muddle and if I got a colour I liked I wouldn’t be able to reproduce. So I set up some records and I’m pleased, and slightly surprised, to be able to tell you that I’ve kept them up to date carefully and consistently. The thing is, I actually quite enjoy writing up what I’m doing. It reminds me of chemistry experiments at school. I was hopeless at chemistry – never had the remotest clue what was going on – but maybe that’s just because I wasn’t interested in what they were telling us. When it comes to dyeing, which is very much the same thing as chemistry experiments, I’m completely absorbed. So, what are my records like? Well, first, every time I do anything related to dyeing, I write it up in some detail in a sketchbook – see photo. This is a page selected at random, but it’s pretty typical of what I write. I find I have to do this straight away, pretty much as I’m dunking stuff into the dyepot because otherwise I forget almost instantly what I’ve done. The next stage is recording the results in another book – this time one that’s long and thin. 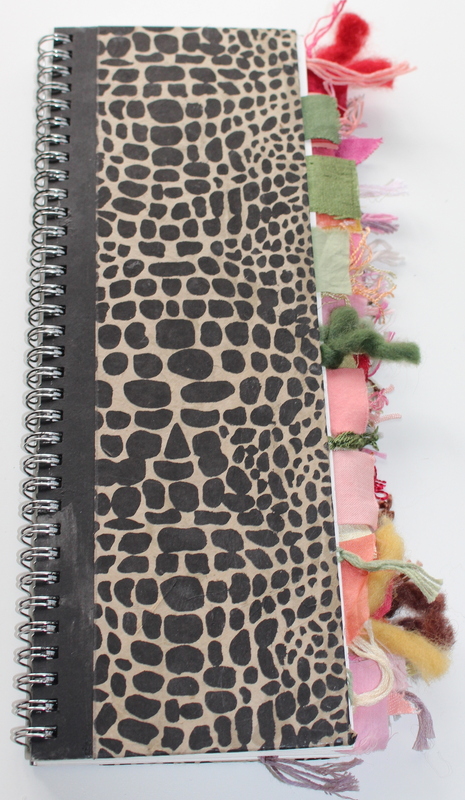 I glue (fabric) or tie (threads) samples of the finished results into the book, in date order. I make sure I date every page, so that I have a cross reference back to the first book. Is this completely over the top? Well, maybe it’s me being obsessive, but I don’t think so. I find it very useful to be able to go back and read about exactly what I did to produce a particular hue or tone. So, maybe it is all a bit over the top, but I find it very helpful indeed, especially at this stage where I’m learning new things about dyeing all the time. Just a brief post today about dyeing with onion skins. 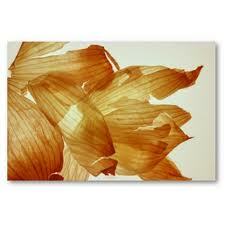 I’ve been saving up onion skins for some time now to get a sufficient quantity for dyeing. 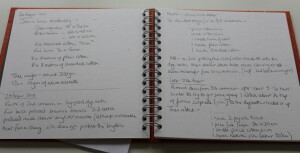 I’ve now collected enough to fill a pan, which is currently (as I write – this is action blogging) coming to the boil. I intend to boil it for about half an hour and then leave for several days to maximise colour saturation before I put any fabrics into it. I’m hoping this works out well, so fingers crossed. I’ve blogged about some of the results of my experiments in natural dyeing, but haven’t said anything much about the basic equipment that I use. So here’s a brief post about dyeing equipment, where I sourced it, and how much it cost. When I started doing this I had two principal objectives: to keep the equipment down to a minimum (it all takes up space) and to keep the costs down. A really important health and safety point about all this is that you have to keep the dyeing process and equipment completely separate from your domestic cooking. 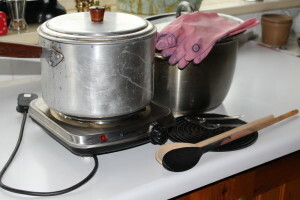 This means keeping separate vessels for dyeing and having a source of heat away from the domestic cooker. In the photograph below you can see the equipment I’ve assembled. The pan on the left has been on the top shelf in the pantry for years, never used, so was an obvious candidate for this purpose. This is the pan I use for the dyeing process itself, scrubbing it out between colours. The pan on the right was used by my son at university but has remained unused since he left, and he has kindly donated it for use in dyeing. I use this pan for mordanting (I’ll write about the mordanting process in a future post). The rubber gloves are useful for keeping the dye powder away from your skin and for using when rinsing through dyed fabrics. Underneath the pan on the left is my electric hotplate, and my main investment in equipment. It cost around £19 from Amazon plus postage. Other investments are two wooden spoons (around £1 each), one used for mordanting and one for dyeing, a silicon mat to put the hot pan on, and a couple of plastic measuring spoons. Total investment a bit over £25. This is really about all I need. If you don’t have any old pans lying unused around the house or a helpful relative to donate them, you could try sourcing them from charity shops. The array of equipment is minimal compared to some of the illustrations you get in textbooks, but it’s not worth spending a fortune on new stuff, especially if you’re not sure that you’re going to take to natural dyeing. This is pretty much all I need, although at some stage I might invest in a cheap sieve which would be useful for straining liquid off when I’m using natural materials. So far I’ve mostly used dye extracts, although I did experiment last summer with rhubarb leaves and will shortly have a go with onion skins which I’ve been collecting for several months. More on that experiment in due course. A while ago I put various fabrics and threads into a new madder dyepot, took them out after a couple of days, then forgot to write a post about them. Here is a photo of the result. 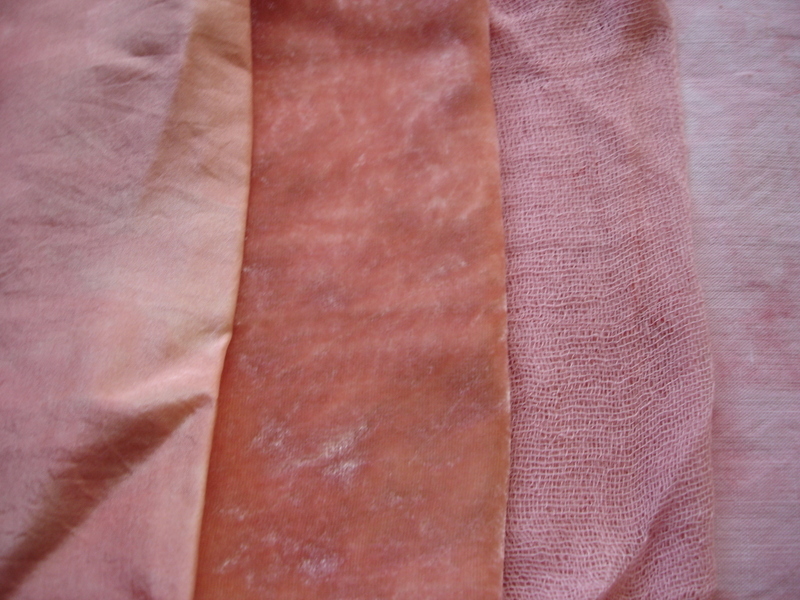 The bright pinkish- red material is fine wool. Beneath it, the cotton is much paler and much less pink. The silk thread in the foreground has emerged from the pot as a relatively pale brown, whereas the cotton is pale mauve. It’s always interesting to me to see what comes out. Unpredictable…. 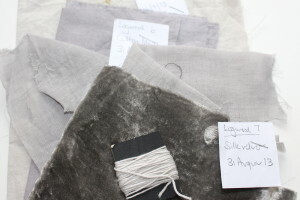 I’ve been very busy with the day job over the last three or four weeks and it’s been hard to find any time at all for dyeing, sewing, drawing or just keeping up with blogposts. And now I have the RSI in my right hand which has slowed me up. But I can still look at things. Today, Friday, I am in London and will be going to the Paul Klee exhibition. More on that next week. What to do with all this naturally-dyed fabric? 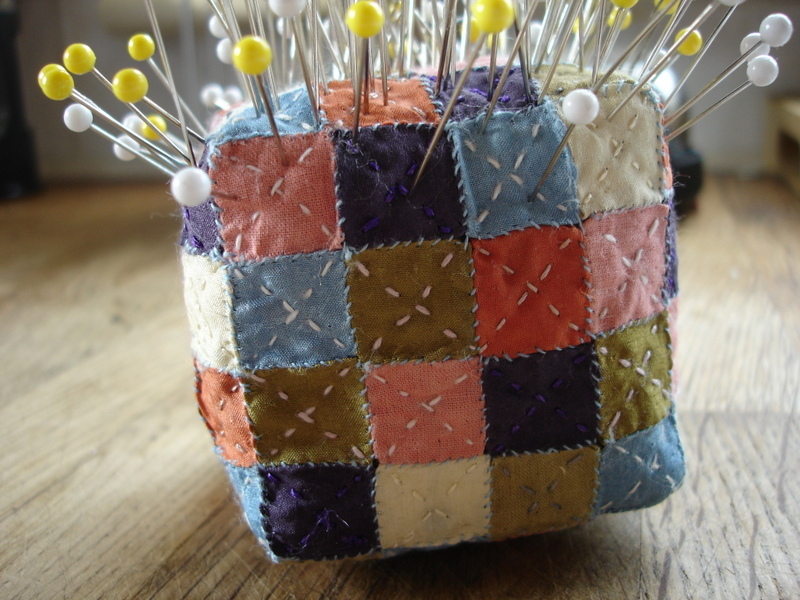 It’s a cube made of 1cm square fabric pieces, dyed with indigo, logwood, madder and something I forget that produced that rather attractive olive green. I made this using the English paper piecing method which was a bit fiddly but still nice to do. I’m currently working on a quilting project using some of the naturally-dyed fabric that I’ve produced since I went to Claire’s workshop. I’ll blog about this project once I’ve finished it. One of the things I’m finding unpredictable about natural dyeing is the way dyes respond to different types of fabric. I’ve tried out several madder dye baths and I’m finding that cotton tends to produce a more purplish-pink, whereas silk yields a more brown/apricot shade. The central strip of fabric in this picture is silk velvet which dyes beautifully. I really love this shade. 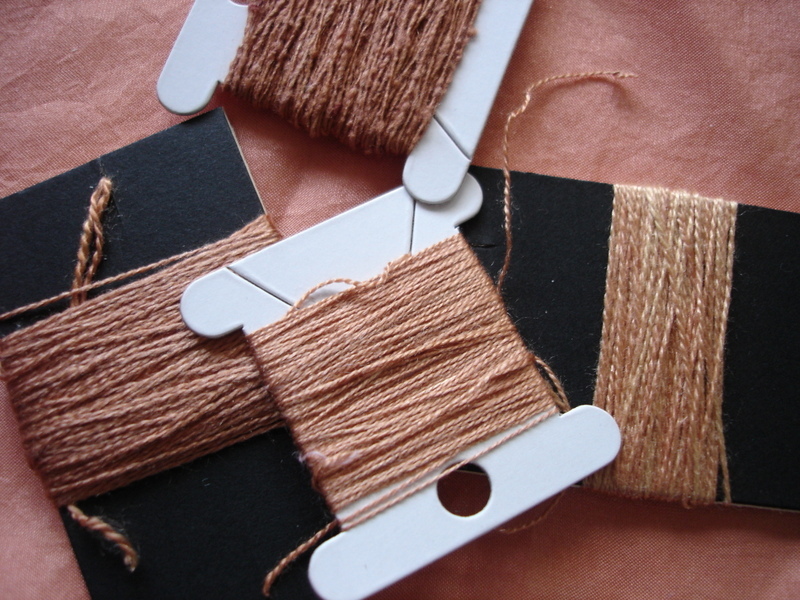 As with the fabrics, silk thread tends to take on a brown/apricot hue. Very attractive, but what if I want to dye cotton the same colour? I know already that it will come out pink. 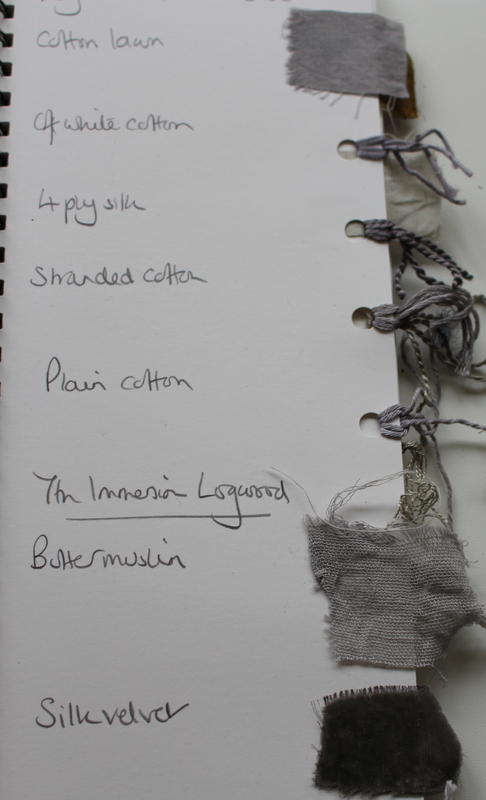 I suppose my overall aim with natural dyeing is to produce a full spectrum of colours in cotton, silk, linen, wool… I’ll keep posting about my success – or failure – in doing this.